Tables and Counters that Disinfect Themselves! Searching for a UNIQUE custom dining table solution? Ancient Metals™ is our newest proprietary hand-applied artisan finish. It uniquely incorporates metals with resin in a complex multi-step procedure that creates a richly variegated end result with a tactile quality that mimics hammered metal to the touch and an aged appearance that imparts the luster of worn patina. 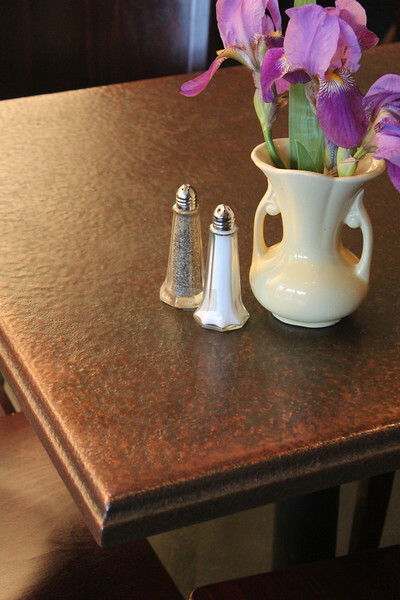 With an array of distinctive and resiliently functional characteristics, our custom-fabricated tabletops provide an ideal retrofit solution for restaurants, bars, cafes, and hotels in re-purposing their existing table bases. Other applications for this distinctive metallic finish are also available including custom entry doors, mantles, wainscoting, cabinetry, and furniture.